A window cleaner came to the rescue of a piece of Banksy art, when he rushed out to save the artwork which had been painted over by vandals. Read more. A study found that tea towels topped the list of the worst contaminated sources in the kitchen, so how often should you wash them? Read on here to find out! 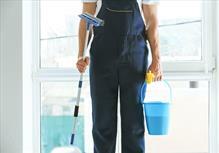 A woman decided to give her house a spring clean after the hectic Christmas period and ended up £900,000 the richer! Read on to find out more details!